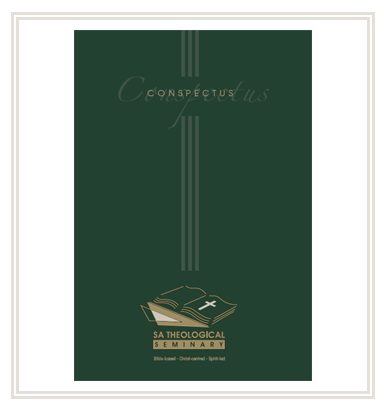 Conspectus, the academic journal of the South African Theological Seminary (SATS), recently published an article of mine advocating the interpretation of scripture from a Christocentric perspective. The significance of this article is not that it is likely to make headlines but rather that that it provides a peg in the ground, paving a way for argument and debate within Christian academic circles on the centrality of Jesus in our theology, church and everyday lives. In the article I argue vigorously for the restoration on Christ-centred hermeneutic approach to the interpretation of the scriptures and their application in everyday life. The article crystalises a year’s worth of dialogue with SATS’ leaders and academics, and will now become prescribed reading for SATS’ students. In all we do, we seek to give due honour and glory to the Lord Jesus Christ. In my recent address to SATS graduates at the recent graduation ceremony, I urged them to oversee the restoration of Christocentricity to the church, to apply the principles to their lives, to pass them on and to influence others to do so too. Will you faithful readers of my blog do the same?